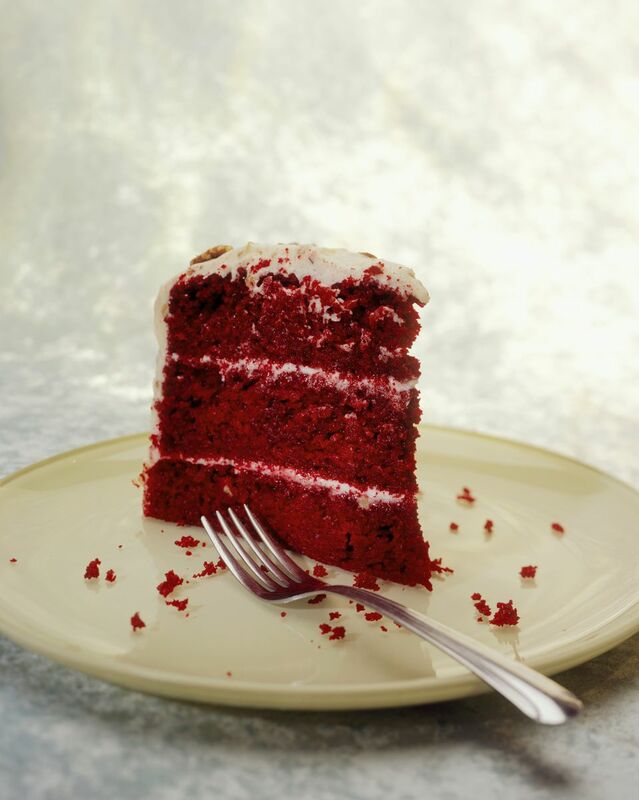 This delicious red velvet cake was shared on our forum. The old-fashioned cooked custard frosting is a classic frosting for this cake but many people prefer a cream cheese frosting. Or top it with your favorite vanilla frosting. Bake the cake in 2 or 3 layers. Homemade Red Velvet Cake With Cooked Frosting​​ - Made with butter. Grease and flour three 8-inch round cake pans or two 9-inch pans. In a mixing bowl with an electric mixer, beat 1/2 cup of shortening with the 1 1/2 cups of granulated sugar until light and fluffy. Add the eggs one at a time, beating well after each addition. In a small bowl, combine the cocoa and food coloring; mix to form a paste. Add the mixture to the creamed mixture and beat until blended. In another bowl combine the 1 teaspoon of salt and 2 1/2 cups of flour. Put the buttermilk in a measuring cup and add the 1 teaspoon of vanilla. Add the flour mixture to the batter, alternating with the buttermilk and vanilla mixture, beating well after each addition. In a small bowl or cup, sprinkle the soda over the vinegar; pour it over the batter. Stir until thoroughly mixed — do not beat. Spread the batter in the prepared cake pans. Bake in the preheated oven for 30 minutes, or until the cake bounces back when touched lightly in the center with a finger. Remove to racks to cool completely before assembling and frosting. In a small saucepan, whisk the milk with 1/4 cup of flour until smooth. Cook, stirring constantly, until thickened. In a mixing bowl with an electric mixer, cream the 1/2 cup of shortening and 1/2 cup of butter until smooth. Beat in the confectioners' sugar and 1 teaspoon of vanilla until smooth. Beat in the cooked milk and flour mixture until light and fluffy.